A major new health strategy to improve the health and wellbeing of people in Lincolnshire has been published. Lincolnshire’s Joint Health and Wellbeing Strategy (JHWS) sets out what all organisations need to do to help improve people’s health and prevent ill health. The strategy follows extensive engagement with those working in health and care, and the public. The first strategy covered 2014 to 2018. Chairman of the Lincolnshire Health and Wellbeing Board, Coun Sue Woolley said: “This second Joint Health and Wellbeing Strategy for Lincolnshire is important in a number of ways. 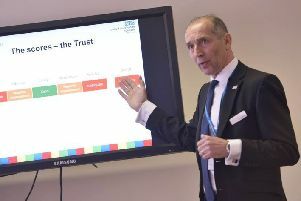 “It represents a clear direction for all organisations that are tasked with and interested in, the health and wellbeing of people who live and work in the county. • The JHWS is evidence-based, and also used the views and insights of key stakeholders, partners and the public.